I love when the seasons change…when the long, hot days of summer slowly get shorter and cooler. Fall transitions into Thanksgiving and then comes Christmas. When spring emerges after a long, cold winter it’s always such a relief to know that warmer days are ahead. 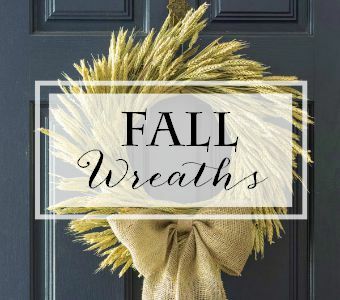 I have always marked the changing seasons by hanging a new wreath on my front door…long before my blogging days even began. I try to repurpose what I have but sometimes I like to start fresh. That’s what I did with this DIY Fall Grapevine Wreath that I’m sharing today. I had the actual wreath but the rest is new. Everything was on sale too so I got a fresh look for not much money. What you need: grapevine wreath (whatever size you prefer,) 5 1/2 inch wide burlap ribbon, one bunch long grass, one bunch berries or tiny flowers, one bunch cascading leaves (or sometimes it’s called a spray,) wire, wire cutters, scissors. I got everything at Hobby Lobby but I know you can find similar items at any craft or discount store. First make the bow using this “how to make a perfect bow” tutorial. Attach the bow to the wreath with a long piece of wire. Separate the blades of grass and stick them into the grapevine above and below the knot of the bow. Using your wire cutters, separate the bunch of berries/small flowers into stems. Stick half above the bow and the other half below the bow. Fluff the cascading bunch of leaves and stick the entire bunch under the bow. If the “stem” is too long, use your wire cutters to make it shorter. Make a hanger from a piece of wire and attach to back of the wreath. Alternate way to hang is to just stick a wreath hanger into several pieces of grapevine…that’s what I usually do. I use this method a lot when I make wreaths. Begin with a bow as an anchor. Add your elements above and below the knot of the bow. The bow keeps everything tidy and I think it looks very finished. It’s pretty much a no-fail way to design a wreath. 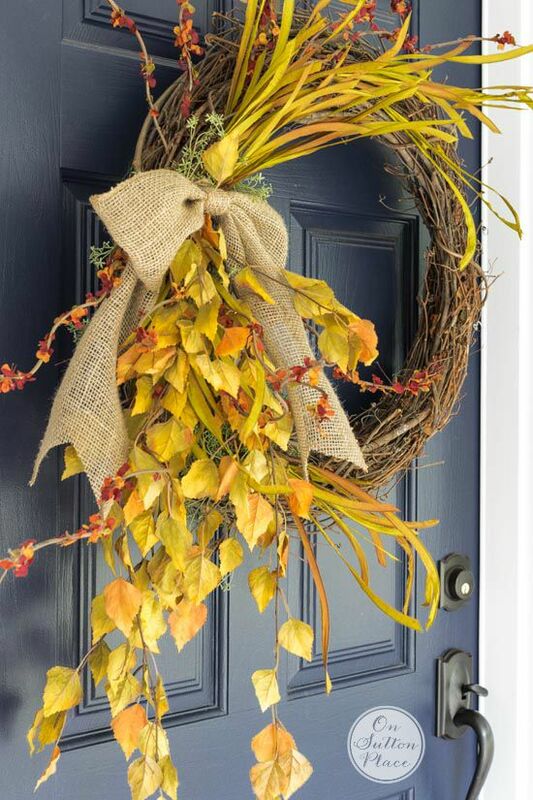 For more Fall wreath inspiration just click the image below! 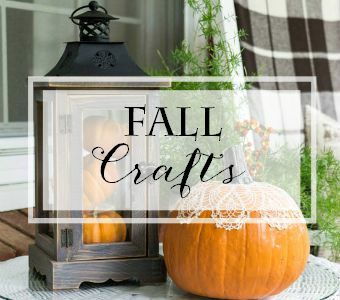 Looking for easy and fun Fall crafts? I have some of those too! 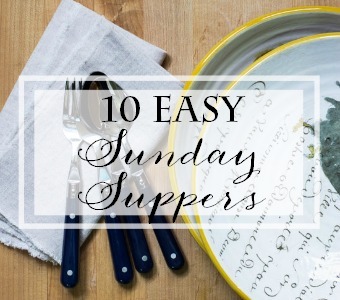 Here are some easy Sunday Supper ideas for the cooler days ahead. In the last photo of your diy grapevine wreath there is a white pumpkin with oak leaves. Did you paint the leaves on the pumpkin? I love the wreath…and the pumpkin! Ann, What a simply beautiful fall wreath! I do the same as you and also try to repurpose things from my collection of fall flowers, leaves, branches and ribbons from seasons past. I also knew my fall wreath had it’s last transformation last year and this year I would start anew. I love the colors in your wreath, they are especially impressive next to your beautiful blue door. If you don’t mind, I think I may try to copy your wreath as close as I can. We have a Hobby Lobby here and though their stock does vary from store to store, I bet I can almost match it. Thank you so much for sharing your beautiful creation. I’ve been thinking about detting the fall wreath made, but wasn’t having much inspiration. Now I do! I saw your comments were closed for your August 30th post, but wanted to give you thanks as well. I stop by your blog several times a month and sometimes look forward to when I have missed a couple weeks so I have lots to catch up on! (It’s kind of like binge-watching your favorite television show hehe). You have helped me love my personal style and be content and happy with the home I have created with my family. I now know how to surround myself with things that I love by using the items I have instead of storing them up in a box not knowing what to do with them. I especially love your wreaths and have made that my season changing tradition as well! Thank you so much for sharing your lovely home with us. You really are the inspiration for a lot of the decor in my own home :) You and your family are in my prayers as you continue to care for your parents. Beautiful wreat Ann, and I love the suggestion of starting with the bow when creating one. A handcrafted wreath on the front door is one of my favorite ways to celebrate the various seasons while welcoming guests into our home. hi! I found your blog on Pinterest, it’s adorable and I will be following you! I’ve been trying to get my blog going and after a few years of unsuccessful following I thought of giving it up but I do appreciate the few followers I have and want to hang in there a little while longer! I love your home, very comfy and inviting!! Very pretty, Ann. I especially like the trailing leaves. Thanks Ann this is different and lovely. 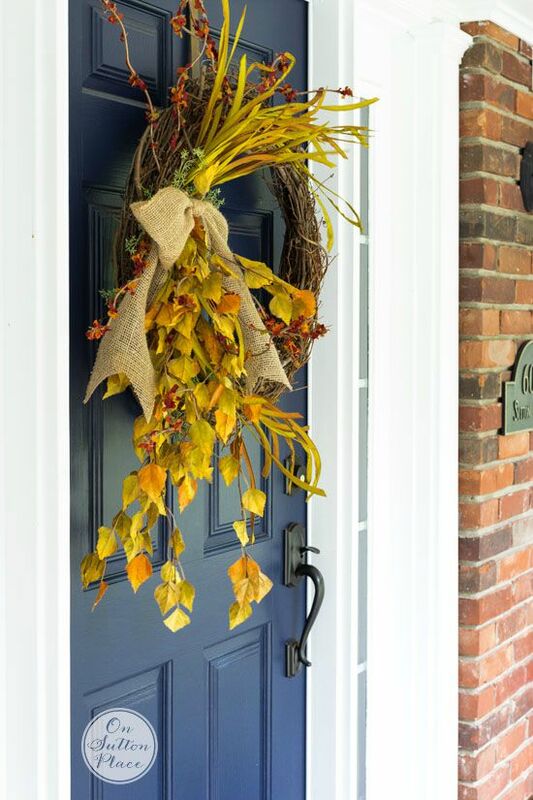 I love how the yellow leaves cascade down across your dark blue door… then the few twigs of orange bittersweet stick out for additional color… and the burlap bow keeps it all organized. It’s beautiful, Ann, and a nice punch of color on your door to begin the Fall season. Love it! It has certainly chilled down here. I had to turn my heat on yesterday to take the chill off my house. Brrr. Though I love my warm summer days I am getting into the Fall mood with the cool down. We are being choked by the smoke of the Rough fire today so it is a must to be indoors when I had planned on taking advantage of the cooler weather to get out and get my Fall garden chores done. Oh well, there is plenty indoors to get done too. Love the wreath and the idea of using what you had plus a few additions. I have a grape vine wreath sitting here, that would be a good thing to work on today. Thanks for the inspiration! I love, love, love the color of your front door. Do you mind sharing what color that is? Hi Carole! The color of the front door is Naval by Sherwin Williams. We used one coat of grey primer and two coats of Naval. Happy Fall! I love making wreaths and usually make one for every season and/or holiday. When I change out my front door wreath it signals the “official” change of the seasons or the beginning of a holiday. This one is really pretty. 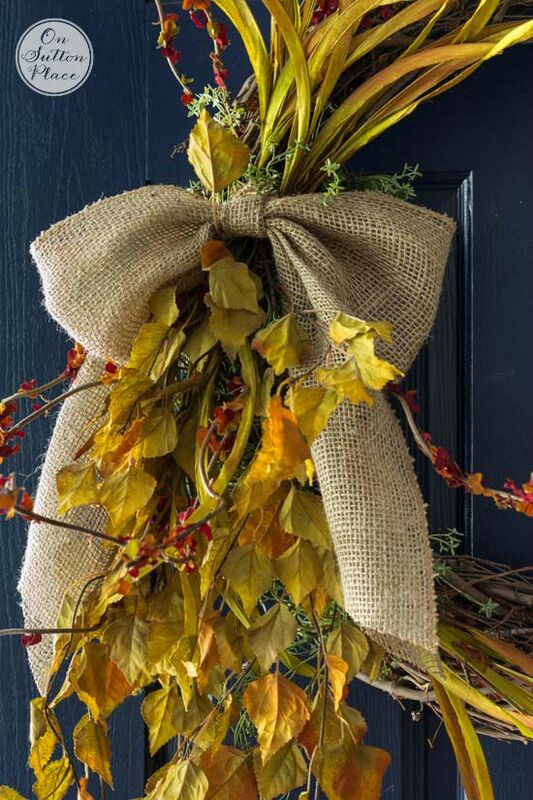 I love that it looks so natural and the burlap bow just really compliments the fall design. Love the cascade of leaves on your new autumn wreath. Pinning it. My red and white geraniums are bountiful in front of my house and I have a red geranium wreath on my door. Being retired three years from the classroom, I truly enjoy September and mark autumn’s entrance on the twenty-third with my fall wreath. Love it!!! Can’t use your idea as mine would get bumped and destroyed!!! But I’m pinning it for future doors lol!!! Nice wreath! I like to start fresh sometimes, too. This is especially true with wreaths which tend to get bleached out by the sunshine on the front door. Thanks for the tips tips & inspiration. Your fall wreath looks great Ann, I wish the cooler weather would come soon. I hate all this hot muggy stuff. Have a wonderful Sunday and relax for the holiday. Such a beautiful wreath! I especially like the cascading leaves. Your technique of placing the bow first is a new approach to me, as I usually plan where the bow will be placed but add the other elements first. I will have to try this on my next creation. I did not comment on your “thanks” post as there were already so many for you to read. I can’t remember how I was introduced to your blog but I have always felt like we would be friends if we lived in the same town. It is always a pleasure to open a new post to see what you are sharing with your readers. Thank YOU! 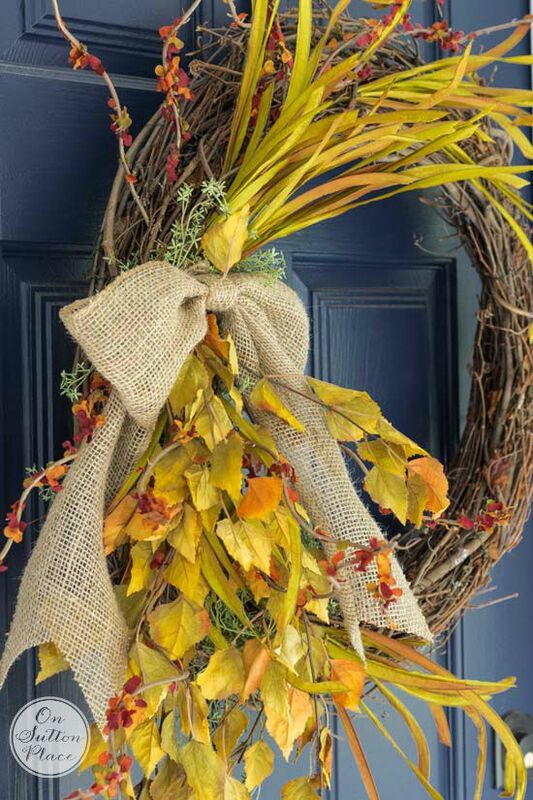 Love this simple and elegant fall wreath. I love the fall ideas and tutorials you’ve shared. Thanks for sharing your creativity! 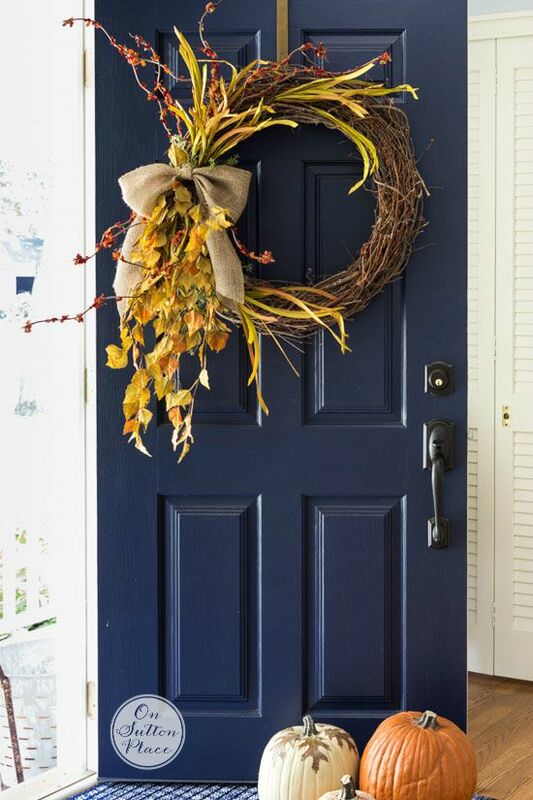 Love the classic, uncluttered look of this wreath….suits my style. This is one I will make. Thanks for the inspiration! Love the simplicity of this – just the right about of “stuff”, very natural looking right down to the burlap ribbon. Great job on this beautiful wreath!